MINTclass is transforming how schools visualise and utilise student information! Helping improve teachers efficiency and giving them more time to focus on teaching. Take a room, a lesson, some students and create a layout template with ease. All the desired academic and pastoral data is displayed alongside the individual’s name and picture. Take your morning/afternoon and Lesson by Lesson attendance easily with only a few clicks in MINTclass. Mark students accordingly and write this back in to your SIMS. The MINTclass Behaviour module is fully integrated and gives you a fast way to apply points. Easy comparison between classes, subjects and year groups. Now with Write Back! 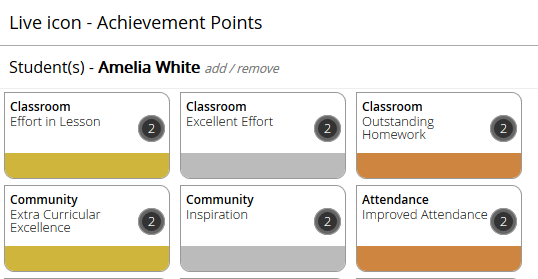 The MINTclass Achievement module is fully integrated and gives you a fast way to apply points. Easy comparison between classes, subjects and year groups. Now with Write Back! so you can choose the package that suits your needs. Setup, Administration and Training is quick and easy, with all online Training included in your Annual Licence fee. We have a dedicated team who can answer any questions and take any feedback you might have. MINTclass includes a wide variety of features at a fantastic, budget conscious price. This includes all training and support. You can add additional modules and customise your bundle how you like. An encrypted website on a super secure server is tied to your school network, so only your school can see your information. MINTclass is fully supported by our development team. WHAT DO OTHER SCHOOLS THINK? Important data was being stored in different folders and was difficult to locate. MINTclass brought everything together in a simple interface.